Raise More Money. Do More Good. An 8 Week Online Course. Start dates are in the column at the right. Now that your new WordPress website is up and running, this course is going to show you 12 very simple things that you can do to 1.) maintain the site so that it’s always in good condition and 2.) allow you to grow the site with new blogs and with new informative pages. Now: The purpose of this course is to show you how to quickly and easily do the most common tasks. Future: Once you’re comfortable with routine maintenance and adding simple pages and blog posts, you can begin exploring some of the deeper areas on your site to find out more advanced things you can do. WordPress is immensely powerful, has an unusual number of free and low-cost tools choose from. We will also show you where to find information from the WordPress community—and provide you with a set of resources in different areas for finding out more in-depth information. But for now, this course will be focused on the basics so you get right to work! Here is what is in store for you: 12 approachable steps. 1. Day one at your new site: An introduction. 2. How to post a new blog. 3. How to add new pages. 4. The difference between HTML (text) and WYSIWIG (visual) editing. Which one is better for you? 5. Four ways to add content to new pages. Find the one that is the easiest for you to use. 6. Links. How to add links both to other pages on your website (Donate here!) and to other websites as well. 7. Photos. How to upload and then insert photos into new page. 8. Documents. How to upload documents into WordPress so that your website visitors can download them. 9. Editing a page. Even after carefully producing a new page you might need to reword a sentence. The best way to do this is to open up the page itself so that you can see it clearly, and then open up the same page in editing mode side by side. 10. Formatting: How to change things like font size and font color. 12. How to find answers from the WordPress community to WordPress questions you may have. The section also includes a set of links to the best online resources that we found for WordPress. This 8-week course is $150.00. There are no other costs nor books to buy: all course materials, editable templates, and guides are downloaded from the course site. How to Enroll. Simply pay the course fee and fill out the Student Enrollment Form by clicking the Enroll Now button just below. 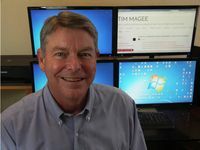 If you have a question don’t hesitate to contact us at: Online.Learning@TimMagee.net. Many questions are answered on our Online Learning FAQ. Upon completion of this course you will receive a certificate. Learn more about Certificates and Diplomas. Website Design & Development for Nonprofit Organizations: Do you need to develop a new web presence for your nonprofit? Or does your nonprofit currently have a website that needs an up-to-date facelift? Our tech team will design a website for you that is elegant and effective—quickly. OL 603 Landing Pages & Simple SEO for Your Website: In OL 603 you will learn how to convert Internet searchers into supporters of your nonprofit by improving the website landing pages that customers see first. Let us show you how to begin optimizing your landing pages and SEO for increased traffic and conversions. OL 604 Mailing Lists and Email Newsletters: In OL 604 you will learn how to capture new newsletter subscribers more efficiently to increase the size and quality of your mailing list. You will also learn how to get more people to open your newsletters and then ‘click through’ to your website to a dovetailed landing page. Six Month Mentored Program in Nonprofit Communications: Work Smarter: Six Months to a More Focused, Organized You. In this 6 month intensive training program, we will focus on improving communication with your supporters—whether they are donors, volunteers, corporate sponsors or your programs’ clients. You will design & launch your own new campaign during the program that will work very closely with your new web site. In fact, you can use the Communications program to begin writing the next set of pages for your web site.